Cross-country skiing is a low-impact exercise that strengthens your upper and lower body.It can also improve your cardiovascular fitness, lower your blood pressure, and assist with weight loss and stress management. While cross-country skiing can certainly be a lot of fun, it takes time and coordination to master. Before you test your skills on the snow, ready yourself physically by strengthening your upper and lower body, improving your coordination and increasing your aerobic capacity with some preparatory gym exercises. The primary muscles you move when skiing are your hips, hamstrings, quadriceps, calves and foot muscles. Use the hip adductor/abductor machine in your gym to strengthen your hips. Leg extensions will strengthen your quadriceps while leg curls will target your hamstrings. Calf raises will help you strengthen both your calves and the muscles in your feet. For each of these exercises, perform two to four sets of eight to 12 repetitions two to three days each week. Your shoulders work to plant the ski poles, and your arms and core muscles help to propel you forward. To strengthen these muscles so they perform optimally when skiing, include exercises in your workouts that target each area. Perform front deltoid raises for your shoulders, triceps dips for your triceps and crunches for your core. Incorporate bicep curls to work the front of your arms. For each exercise do two to four sets of eight to 12 repetitions, two to three days each week. 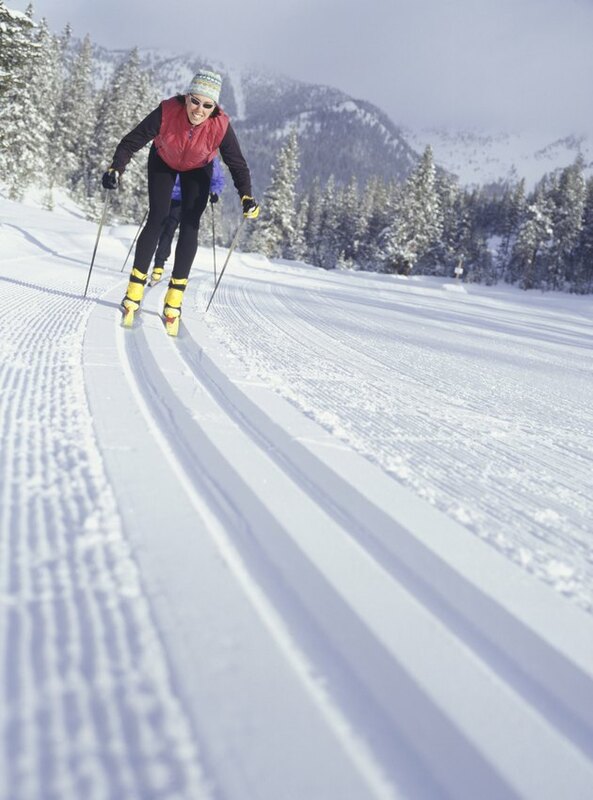 Exercise ski machines simulate outdoor skiing while offering varying upper and lower body resistance levels and incline adjustments. Training on elliptical machines will help you improve your coordination and increase your overall aerobic capacity. According to the American College of Sports Medicine, adults should get at least 150 minutes of moderate-intensity aerobic exercise each week. Gym exercises can certainly help you prepare for cross-country skiing -- but they are definitely no substitute for moving along the snow-packed terrain. When you are ready to transition from exercising indoors to skiing outdoors, consider seeking the assistance of a certified instructor or experienced skier. Start out slowly and gradually work your way up from 10-minute to 40-minute ski sessions. When you are ready for more of a challenge, begin incorporating inclines. Work within your level of skiing capabilities and be safe by always skiing with someone else. What Are the Benefits of Gym Membership? What Exercise Burns Fat Around the Waist & Hips?